In my previous blog post, I showed you how to create a simple location-based News App on Android using Matchmore SDK and Kotlin. Today, we're going to create a location-based app with additional functionalities from scratch. To make the app richer, we will add a real-world context by integrating beacons. We will create an event app which can be used for a festival, or any other event including tons of people. Let's call the app Matchmore Festival! Don't forget to have a look at our other blog post about events where we outline smart location-based functionalities for event mobile apps. But for now, grab a beer or a coffee and let's start! The first one will embed a Find your friends function. With our app, the user is be able to create a cluster, or join an existing cluster. The users will then broadcast their positions to their friends in a predefined area. Android Studio with Kotlin support installed on your computer. Download Android Studio for free here. A Matchmore account to start using the service. You can register for free here. At least two Android phones running on Android 6.0+ (API level 23), if you want to test the app in real life. Else, you can test it via the Android Emulator. Creativity! This blog post will guide you through the potential of using Matchmore for your location-based app. You are intended to improve the layouts and the scenario in order to adapt it to your own needs. On Android Studio, create a new android project with an empty activity. We will call our project Event. In order to start creating our app, we have to set up the tools that we are going to use. In this project, we will use the recommended way to check the permissions, the Matchmore Android SDK and Google Maps SDK as a mapping service. To start using Matchmore in your project, you have to create an account on the portal. After you have created an account, you have to create a new app and get the API key. Add a new build rule under dependencies for the latest version of play-services, using one of the APIs listed below. Create a Google Maps Activity named live, then follow the instructions in the google_maps_api.xml file to add a Google Maps API key. This new activity will be use later in this tutorial. On the landing page, the user have to select a functionality. Either he chooses a find your friends function or decides to go for the festival guide. If the users choose to go for the Find your friends option, they will identify themselves and provide their group name. The group name will be used to make the pub/sub that will allow us to create a match between the users. When there is a match between the users based on their group name, we can collect their information such as their GPS position and broadcast them on a map. The Festival guide is expected to be as simple as possible. The main purpose of this part is to learn how to integrate and use the beacons. Basically, our landing page will contain of two main buttons which will redirect us either on the Find your friends functionality or on the Festival guide. I created a simple layout for the landing page. The goal of this functionality is to help the user to find his/her friends within a particular range. The user will also be able to receive a notification when one of his/her friend enters the predefined range. To achieve that, we have to create clusters of people who are friends. The user will only be able to detect people if they are members of the same cluster. To make it simple, we will allow any user to join any group just by typing the groupname in the corresponding textfield. In order to identify each user on a map, we will ask them to add their name before joining a group. Once it's done, we will use the information sent by the users to broadcast their position on a map. But before starting, we need to make sure that we have all the required permissions to get the user location. If the required permissions are granted, we start updating the device location. After building the layouts and setting up the permissions, we can broadcast the user's location and listen if there's a user with the same groupname in the device's range. As you can see, we created a publication that will last for 2 days (172 800 seconds) and within a wide range (5 000 m). Feel free to edit the values depending on your needs. The parameter matchDTL (in meter) provided to the subscription allow the user to refresh the match when the position of the publisher or the subscriber change. As explained before, the second functionality of our sample app is a festival guide that will allow the user to get information of point-of-sales on a festival area. The main purpose of this part is to show you how to set up the beacons and integrate them with Matchmore. Here we go! Since formatting is not our priority, we will add a simple list to our layout. This list will be populated every time a new shop is detected nearby. Before using the beacons, you need to register your beacon devices on the portal. After logging in, click on Beacons and register a new beacon by adding the beacon's name, its UUID, Major and Minor. For our scenario, let's assume that there is a beacon placed at the entrance of each shop. Every beacon will be linked to specific information. Using Matchmore, this information will be advert through publications in the properties. To create a publication on a beacon, go on the portal, then click on the Tools, then Create a publication. Set up a topic, the range, the duration and the properties of your publication. Please, be aware of the maximum range of your beacon before setting up the range in the publication. After setting up the beacons and discovering how they work, we can keep working on our app. To get the information sent by the beacons, we have to create a subscription based on the topic that we want to use. 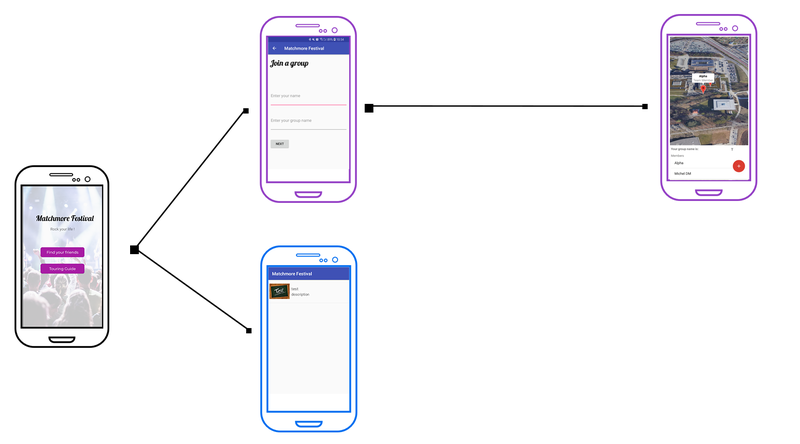 Build an app for borrowing items from your neighbors nearby, using Xamarin and Matchmore. This blog post explains how a security service company can benefit from location-based features. Out solution contains several examples such as real-time incident reporting and automatic shift reporting. Enjoy! Beacons are becoming more and more popular for tracking objects in real-time. However, the issue of spoofed beacons are also growing as an issue. Learn how to prevent your beacons from being spoofed. We offer solutions for both Bluetooth 4.0 beacons and Bluetooth 5.0 beacons. Read this post today!